The 24/7 is an octagonal shaped flashlight from Inova featuring 8 5mm leds: 4 white, 2 amber and 2 red. The flashlight is powered by a single C123A lithium battery. The flashlight is activated rotating the octagonal bezel where the leds are, it has nine modes of operation. The first mode is low-intensity white, good for general use as a task light it has a runtime of 15 hours. The next mode is high intensity white runtime of 6 hours brighter for signaling and suitable for walks or hikes if you use the light attached to your backpack strap. Mode number 3 is a white strobe that can run for 100 hours. The fourth mode is an SOS signal using the white leds. The fifth mode is a red&yellow wig-wag. Mode 6 is a white, red and yellow strobe. Mode #7 is just red suitable for preserving night vision. Mode #8 can be accessed putting the bezel in between any two of the regular settings, then the two red LEDs will flick on every 15-20 seconds, this can be used as a locator to find the flashlight at night. The runtime is 15.000 hours in this mode. If you ask a bout a ninth mode then mode nine is off. There is a clip on the back of the light to clip it to a backpack, epaulet or belt. It also comes with a neck lanyard. The construction is solid and the flashlight is waterproof. The interface is very easy to operate but not very powerful, brightness can't be controled except high-low white and the amber leds are completely wasted being only used in one of the many signaling modes. The red leds have only one mode of operation and the strobe can't be regulated. For about $40 it is probably a good signaling and backup light to hang from backpacks or belts, if the modes suit your needs it is certainly a great item. 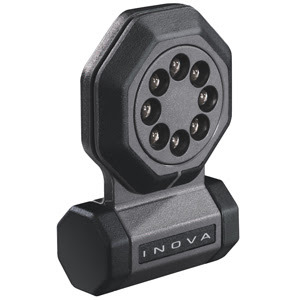 It is available in yellow and black, you can read more in Inova's product page. To order check this links. This is a 5 in 1 emergency tool primary intended for drivers. The tool is 3” x 1-3/4” x 5/8” in size and weights about an ounze. The first of the five tools is a window glass breaker, basically a spring activated mechanism to break side windows in case of emergency. Then you have a seatbelt cutter, an alarm to attract attention, a red beacon and a white flashlight. The device is powered by a single AA battery, it is small enough to be carried in almost any compartment or even in a keychain probably intended to be carried with the car keys. It relases from they keyring with a quick tug for fast emergency use leaving the seatbelt cutter exposed. The construction in ABS plastic is solid and the device will be waterproof and impact proof. The color is probably not the best option for an emergency tool and a whistle might have been better than the electronic alarm because it doesn't depend on the battery. A small and practical tool for road safety. You can read more about it or get it for $20 from SwissTech's website.